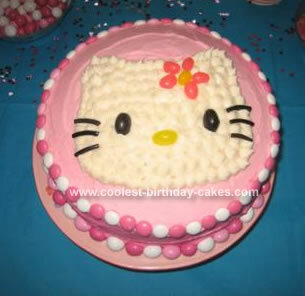 This Hello Kitty cake was for my 3 year old. I usually come up with the cake idea and then my husband hops in to do the detail work (when I’m frustrated and near tears! !…at midnight!). The frosting is a darker pink for the sides and a lighter pink for the top (no, that was not intentional!). Her birthday is 2 days before Valentine’s Day so there are always plenty of pink candies to be found to decorate with.